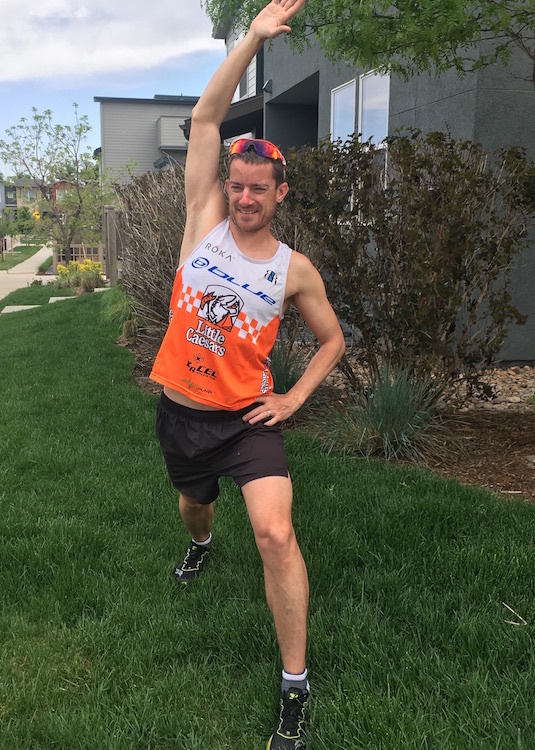 Jimmy Buffett has a good song titled “A Pirate Looks at 40.” In my eleventh year racing as a professional triathlete, I too had to look at turning 40. Even though I’m still 23 in my head, I know the realities of advancing age versus athletic performance. After over 15 years in the sport of triathlon, in my last year of racing, I was able to achieve my personal best Ironman 70.3 time only two months before my 40th birthday, and my personal best full-Ironman time only three weeks before the big four-oh! I was very proud of the fact that despite my age on paper, I proved to myself that I could perform better than I could in what most consider their “prime” racing years. I learned quite a lot over my last few years in the sport about effective ways to approach training and racing as I aged. If you read my last XRCEL blog about injury prevention, you’ll notice similarities to the content I share here. This is simply because as we age, our injury risk increases. While there are common themes with that last blog, here I want to point out some specifics for the masters athletes. These tips are not exclusive to triathletes, but the ideas here can benefit all athletes. Wisdom is Your Best Asset – You’re not in your twenties anymore, but that also means that you have your wisdom to guide you through your decision making. As we go through the months of training to prepare for an event, then executing on race day, we’re constantly faced with decisions that will impact our training, recovery, risk of injury, proper execution of workouts, and being smart on race day. Learn to rely on your knowledge and experiences to help make smart choices. The ego, courage, and bravado of youth can lead athletes astray from making good decisions. Use your wisdom to help you avoid some of the mistakes a younger version of yourself may have made. Acknowledge the Changes – Our bodies are changing, that is a fact. We all need to acknowledge those changes and then learn to work with them instead of fighting against them. This goes back to my previous point about using your wisdom in decision-making. I know that I can’t fly across 8 time zones or have an extra couple glasses of wine in the evening without it taking more out of me than my younger self. If I stay out later at a party, I’m going to pay the price the next day. If you find yourself ever saying that you USED to be able to do something, then take note of that thought and don’t try to do it now. Let the younger athletes abuse their bodies. Acknowledge the changes, be smart, and work within your own new parameters. Make the Gym a Priority – It is a fact that as we age, we begin to lose muscle mass and strength. Both men and especially women also have to deal with the loss of bone mineral density (think of staving off osteoporosis). The best way to combat these two serious issues is to maintain gym work as part of your routine. I know there is a constant debate about lifting weights and endurance sports, especially when it comes to the question of lighter weight/more reps vs. heavier weight/fewer reps. I’ve had conversations with several strength and conditioning coaches for some of the world’s top Ironman and Ironman 70.3 professionals. Their consensus is that for endurance athletes (even aging ones) that heavier weight and 6-8 reps per set is the sweet spot. With the heavier weight, you will stimulate your body’s natural hormone production. A little extra natural HGH production will make you feel younger and give you more energy. If you also work on some of your stabilizing muscles and muscle engagement, it can help with injury prevention. Spending time in the gym will help keep you healthy and feeling young. Intensity is as Important Now if Not More – We maintain our endurance extremely well as we age. You won’t see the level of degradation of your aerobic capacity as you will the fitness associated with harder, more intense efforts. There’s a reason you see a lot of excellent ultra-distance endurance athletes (think 100 mile runners and extremely long distance cycling events) who are over the age of 40. It’s the upper level areas of your fitness like the fast twitch muscles (sprinting), VO2 max (60-120 seconds), and threshold (under an hour effort) that are the areas where we lose the most fitness as we age. Because the workouts to train those engines are difficult and hurt, many masters athletes fall into the trap of long and slow. For these reasons, it’s important to keep intensity as part of your training to reduce the degradation of upper fitness levels and keep you fast and strong. Different Approach to Recovery – As we age, we need more recovery time to absorb hard training. When I was in my twenties and early thirties, I could train hard day-after-day, with little recovery time. Looking back at old training logs, I’m shocked at how much hard training I could do. Over the last several years, I had to work with my coach to make adjustments to my recovery approach so that I could hit the hard workouts with the intensity they require. This simply meant I couldn’t push hard every single day in every workout. I also learned that over the last several years, I lost fitness much faster and it took longer to get it back if I took too much recovery or time off. In my earlier years, I could take a lot of time off in my off-season and be back in shape after a month of hard training. Recently I found the more time I took completely off, the time to regain my previous fitness increased significantly. I found that maintaining lighter training and recovery workouts helped recovery, without spending too many days off on the couch, and was the key to finding the balance between recovery and losing fitness. Nutrition – When I was a new triathlete in my twenties, I would go on some of my long bike rides and eat absolute garbage like Pop Tarts and Doritos. I got away with it because I was young. Looking back, I now know that I could have performed better had I taken my training nutrition more seriously during those early years. As I’ve matured as an athlete, I learned how important sports nutrition is to my performance. Working with XRCEL Athlete Fuel, I found a product whose formulation with its extended release micro-gel technology kept me better fueled for my workouts and racing. With it, I was able to continue to perform at a higher-level despite being “over the hill” in terms of professional racing age. Mobility – Coaches and trainers love to talk about stretching and foam rolling. While I think they both serve a function and have a valuable place in all athletes’ training regimes. I’ve found that mobility and activation are as important, if not more, to maintaining my body function and performance as I’ve gotten older. I’ve previously written about Lawrence Van Lingen and his approach and techniques to improve mobility specifically for running. My coach and Lawrence simplified the terminology to call it “happy hips.” It actually refers to sets of exercises and active stretching to help your body increase it’s mobility and engage critical biomechanical functions for increased performance. While all athletes can benefit from incorporating mobility exercises into their programs, I’ve seen it greatly benefit aging athletes as we start to lose flexibility. Search for Lawrence Van Lingen on Youtube to find his channel and spend some time watching his videos. It’s an excellent investment of your time for increased performance and injury prevention. Warming Up – We all know someone, usually in the office, who tore their hamstring playing softball. As we age, our muscles aren’t as supple and those types of sudden ballistic movements put us at an increased risk of injury. The same is true for starting out too quickly in your workouts. Make sure to be disciplined about taking extra time to warm up to get your muscles ready to go. If you train with other people, you need to be smart about it. If I’m in a small group of 2-4 people, I never have a problem asking if we can warm up a little slower. If it’s a bigger group, it’s harder to settle everyone down at the start of a ride or run. I found that if a training group starts too quickly for me because of the young bucks at the front, I show up 10 minutes early to the run and jog around to get my body nice and warmed up at my pace before the group dynamics take over. Use Technology to Stay Competitive – Let’s face it, if you’re getting on in your years, you’re probably at a more advanced point in your career than you were a couple decades ago. Hopefully with that comes a little more disposable income. The great thing about sports, especially when it comes to triathlon, is that there is always better equipment available where you can “buy” speed. As technologies of each sport advance, you can find small, or sometimes large chunks of time by using better or faster equipment. One of the most innovative companies for total body fitness is the Peloton bike and new Peloton tread. Just like XRCEL provides cutting edge technology to fuel athletes to peak performance, Peloton provides the technology for athletes to increase fitness and performance. Other “high-tech” examples can be in the form of gear like running shoes, swim speedskins and wetsuits, bikes and any associated cycling equipment, and even nutrition. Investing to upgrade your nutrition to XRCEL over an inferior sports nutrition product can keep you racing faster by keeping you properly fueled for your training and racing. Using your purchasing power advantage will help keep you competitive. Shaving off time here and there can add up to big gains in the big picture of your racing. Use Your Age as Motivation – I’ve heard random people say snippets like “I was the fittest of my life playing high school football when I was 17.” That doesn’t have to be you! The Baby Boomer generation has been redefining what it means to age and that being “old” is only a mindset. I think the following generations will continue to prove that age is only a number. Use your age as a motivation to push yourself to a new level of fitness that you didn’t know was achievable. There’s no reason you can’t be your fittest in your 40s. Show yourself that you can do something in your 50s and 60s that you never would have dreamed possible. When the task seems insurmountable, think about how good it’s going to feel to pass those twenty-somethings in your next race. We have our ages written on our calves in black magic marker by race organizers in triathlon. Own it and wear it as a badge of honor! Just because you have a few more candles on your birthday cake these days doesn’t mean that you can’t have some of your best racing ahead of you. I proved to myself that age is only a number. I have friends, my age or older, who are still competitive against the top professional triathletes in the world. If you heed the advice I’ve shared here, you too don’t have to surrender to Father Time when you toe the line at your next race.